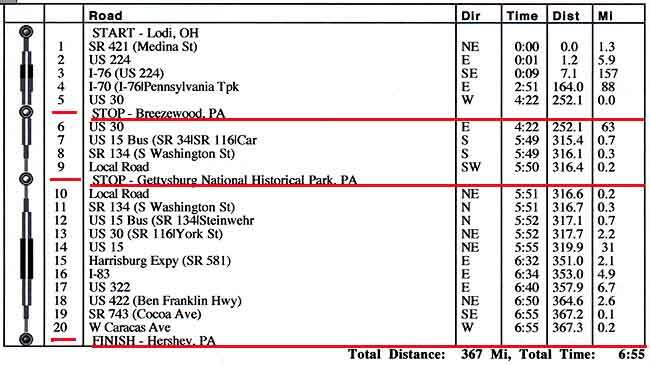 Gettysburg Info Possible Dates . The following directions, comments, advice were sent to me by the authors I have indicated in the text. from Rush Wickes. . . I did the trip through the two abandoned tunnels on foot in May. I would suggest that the best way to access the Sideling Hill tunnel would be from the east end. This would be reached by turning off Pumping Station Road at the overpass for the old roadway and parking along what was the access road for the old Cove Valley service area. All that would need to be navigated would be one or two jersey barriers placed across the road - I believe they can be squeezed around on bike or foot. I would advise against trying to enter/leave the roadway at SR 1011 (Mountain Chapel Road, I believe is the name). At this point, the old road passes over SR 1011 on an overpass, with _very_ steep embankments and no visible alternative. 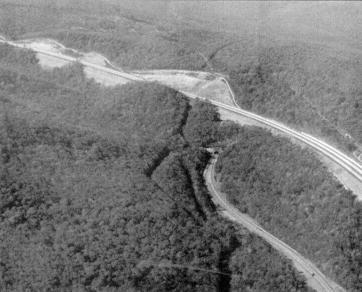 I believe one can safely access the old Turnpike from the south end in Breezewood, just behind what is now a Ramada Inn parking lot. rather rough in most stretches. Have fun! 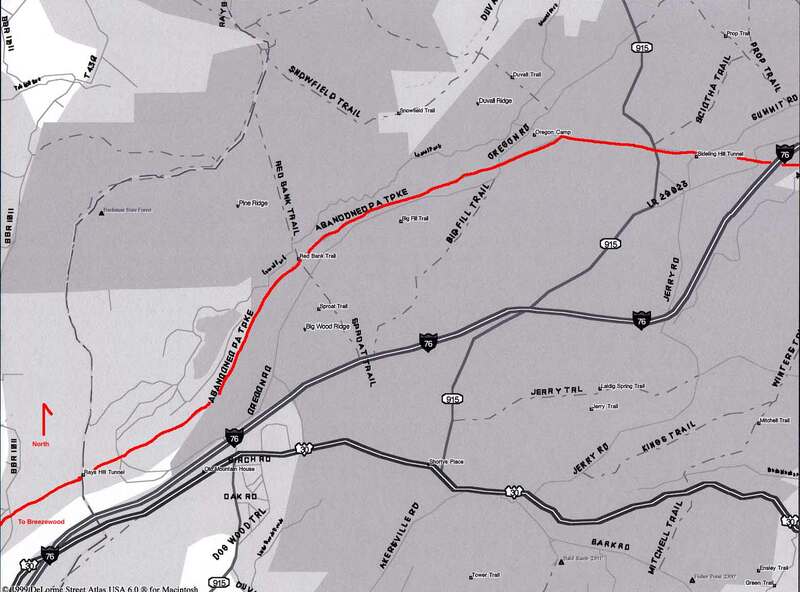 Here is a map of how to get to the old Sideling Hill Tunnel on the long abandoned stretch of the PA Turnpike. Heading out of town on US 30 east from Breezewood - go up the mountain and cross over the modern Turnpike on an overpass. Continue up the hill and watch for PA 915 North, which will join up with US 30 briefly and then turn off to your left. Make a left onto PA 915 North at this point and follow it across another overpass over the modern Turnpike. Then, you will see an intersection (a fork, I believe), with a road to your right. Take this road to your right and follow it down the mountain -- soon you will be paralleling the modern turnpike on the northern side. an overpass - this is the old Turnpike. Park here and take your bikes around the barriers and continue up for about a 1/2 mile or so. You will come into the old service area - which later served as a firing range for the State Police (don't worry, it has long been inactive, despite the warnings still posted). You will find the Sideling Hill Tunnel about 2 miles north of Cove Valley on a very gentle, if roughly paved incline. Have fun!! the west portal of Ray's Hill Tunnel). to check it out for myself! own pace and enjoy the experience. have experience in that part of the USA. Glad to hear from you again. Hope you enjoy your trip to the tunnels. Point"? But also the "Drop Off Point". NOT an easy thing to do. I kept sliding back down. To try to clarify the second part of the last message. the first half of it. road, which will take you to Oregon Camp from the other direction. I hope that clarifies it a little. The following directions, comments, advice were "borrowed" from John Barrick (j_barrick@hotmail.com). The western portal of Laurel Hill tunnel is easily visible if you stop your car on the eastbound side of the turnpike at MP 99.2. This is between Donegal (exit 9[milepost 90.7]) and Somerset (exit 10). Off to the right side of the turnpike you'll see a service road which intersects with the old right-of-way. This portal was being used as a salt storage area when I was last there in October of 2000. The eastern portal of Laurel Hill requires either a long hike (1 mile) from a remote area or trespassing from the current right-of-way in full view of any troopers on the turnpike. I'm not going to go into that, there are much easier pickings at Ray's Hill and Sideling. (ed note) - if you would like to explore Laurel Hill (which I highly recommend), please take a look at: http://www.angelfire.com/wv/joyrde/papike.html My family and I made this a couple of years ago. As some who is handicapped, I can honestly say that the hike is not that bad. To get to the western portal of Ray's Hill, take Rt 30 east of of Breezewood[milepost 161.4] up the mountain. You'll get to a road on the left (ed. note SSR 1011)that goes to the western portal of Ray's Hill. I think it's the only road off to the left (ed note:on the map there are two lefts . SSR 1011 is the second left) . You'll see an overpass, kind of Art Deco rounded corners, you'll recognize it as vintage turnpike. Climb a short hill and you're right there. To get to the area between Rays Hill & Sideling Hill is easy. Take Rt 30 east out of Breezewood up the mountain, past the road to the left that goes to the western portal of Rays Hill. When you are up on top of the mountain, the road (Rt 30) will be relatively level, and you'll be traveling parallel to the new turnpike. There will be a gravel road that will be on your left (heading north [ed note Oregon Road???]). It will go under the new turnpike, and you can see this overpass from Rt 30. I think its the only such road, so you shouldn't mistake it. Go on this road under the underpass. A short distance after the underpass you have to turn either left of right. 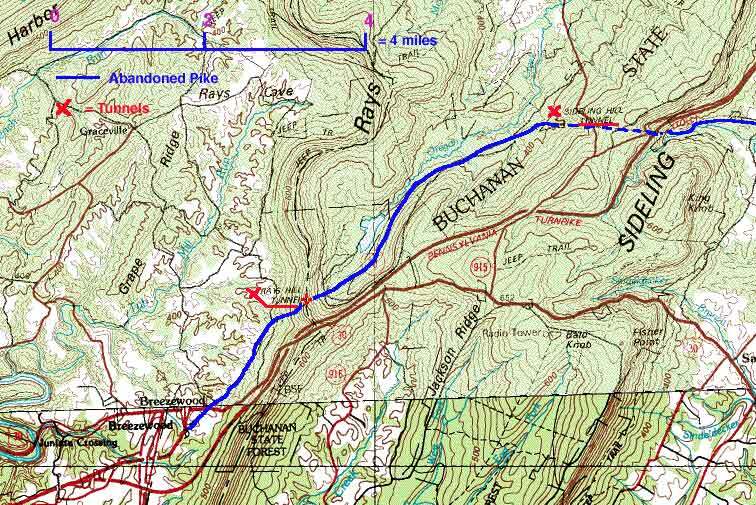 Go left to Rays Hill (A below) or right to Sideling Hill (B below). This road loops around, heading west initially, then turning north, and finally heads back east. It goes to some kind of a camp. When you are at the lowest point and heading north, you are directly over Rays Hill. You can hike directly down the hill there (heading east), and you'll end up on top of the tunnel entrance. (There is no fan house at this end of Rays Hill, just a concrete wall.) Look behind this concrete wall for the old stone wall that was there for the railroad. Alternatively, if you back up on the road, you might still be able to see the remnants of an access road that also goes down to the tunnel. This was getting pretty badly overgrown, so it might be hard to see. This road went past a transformer pad (long gone) and kind of comes down alongside the tunnel and eventually joins the old roadbed. This road is pretty narrow and not travelled much. If you have trouble turning around, continue on it to the camp. Also, the point over Rays Hill should be obvious, because this is the apex of the loop and the road will be turning more sharply. Follow this road for several miles. You'll be gradually be going down hill, and eventually you'll get down to the elevation of the old roadbed and you'll see it off to your left. Then you pass under it. Maybe 1/4 mile past this overpass, you'll see what appears to be a forest ranger's camp. It'll look like a log cabin. Park there, and look for a trail that goes off behind these buildings and a little to the left. Since you are now north of the old highway, you'll be heading roughly 170 degrees by the compass. There was a gate across it last time I was there to keep vehicles out. This trail was an access road to Sideling Hill. I never paced this trail, but it isn't too far until you'll come up to the old road and from there you can see the tunnel. You'll pass some old sheds on this trail; I think these were home of the wrecking/breakdown crew that was staged here at all times, at least in the summer, to clear out "problems" blocking the single-lane tunnel. To get to the eastern portal of Sideling Hill, and the old Cove Valley service plaza, continue on Rt 30 east until you come to a road called "Pumping Station Road" (how appropriate!). Go down there, probably about 4-5 miles. It will change surface (gravel/asphalt) several times. You will come to an underpass which is the old right-of-way. Before the underpass will be an old access road, blocked off with temporary concrete median barriers. From there you can go left and walk on the old right-of-way, or continue under the underpass to another service road. This is the old road where tanker trucks delivered fuel to the service plaza. The plaza has been torn down, but the parking area and access roads remain. Please be careful, when we were there in 1997 there was a sign at the old service plaza that said it was a shooting range. I heard no shots but I wouldn't wander in there. About a mile down the road after the service plaza is the eastern portal of Sideling Hill. Good luck exploring on your trip. Again, please leave a reply to this thread if you use these instruction and let everyone know how your trip went. If you post pictures on the web, if you include a link to my site and send me an e-mail, I'll add a link to my site.